EUscreen is collaborating with FIAT/IFTA’s Media Studies Commission on a joint seminar, which takes place on Monday March 20th at the ISCC in Paris. Sixteen papers will present different views on the legacy of 1968 in the media across the globe. A selection of the symposium’s outcomes will be published in EUscreen’s open access VIEW Journal. Attendance is free, but registration is required before March 12th via Eventbrite. On Tuesday, March 21st the EUscreen Foundation’s participants will convene for an internal full-day network meeting. Much thanks to our colleagues at Ina for hosting both events! EUscreen announces its Network Meeting in Paris on Tuesday 21 March. The Network Meeting takes places at The Institute for Communication Sciences (ISCC) in Paris and aims to share expertise and best practices amongst the network participants. During the network meeting Programme, we will go through Status Updates on the Foundation’s activities and our continuing collaboration with Europeana. There will be ample time for discussions and we’ll will be working in roundtables on the proposed EUscreen strategy for the coming years. The Archive team from Norwegian broadcaster NRK will present their Aggregation Case Study and Eve-Marie Oesterlen will present on the aggregation flow under the Europeana DSI-2 project. In the afternoon, we’ll work together on content curation ideas in the workshop ‘Making Meaning-Curating online material on the televisual legacy of 1968’ and will end the meeting with a screening of a selection of EUscreen materials. If you are a network member and haven’t registered yet, do so as soon as possible – and March 12th at the latest – via Eventbrite. We look forward to welcoming you in Paris! The meeting will be preceded by an international seminar organized by the Media Studies Commission of FIAT/IFTA on March 20th. The symposium is open to all everyone who’s interested and attendance is free, but registration required before March 12th via Eventbrite. From the Prague Spring in the former Czechoslovakia to the student protests in Paris and civil rights movement in the United States, the protests of 1968 marked a series of national and transnational events that captured media’s attention. At the symposium, 16 papers will present different views on the media coverage of the political and social events that took place across the globe in that year. The seminar is organized by the FIAT/IFTA Media Studies Comission in collaboration with INA Institut National de l´Audiovisuel and the EUscreen Foundation. Its outcomes will be published in EUscreen’s open access VIEW Journal. 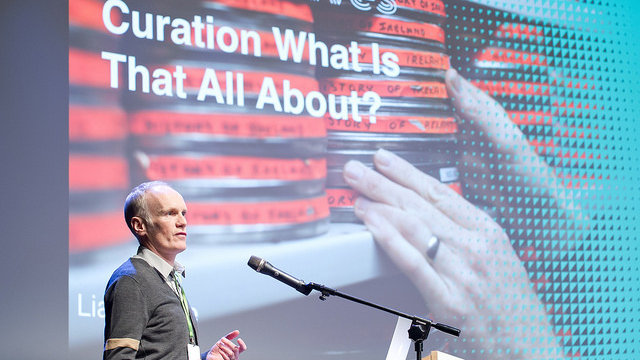 RTÉ Archives' Liam Wylie during the 2015 EUscreenXL Conference. Photo Credit: Bartek Syta for Narodowy Instytut Audiowizualny.